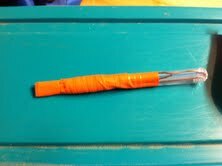 Here’s what you’ll need: Straw, needle, tread, safety-pin, and electrical tape. Step 2: Insert a safety-pin about an inch into the end of the straw. Fold the end over and close it with electrical tape. I guess super glue or melting would work for closure. I like the tape. It gives more options in the field. That’s it. These are lightweight and will double as a drink stirrer when you stumble upon the moonshine still down by the creek. Hope you enjoyed. The tape will be difficult to remove from the thread. Plus, the tape will have sticky on it, that sticky will make it difficult to pull the thread through fabric. Not really. The first brown thread is waxed and very thick. It’s diameter makes it difficult to pull. Once pulled, it holds. The other thread is a carpet/upholstery thread larger in diameter than normal sewing thread. Have you tried this yet? I’ve pulled the tape off with easy. It’s not duct tape and doesn’t leave sticky all over the tread. Give it a shot and let me know what ya think. Thanks. If you use a smaller diameter coffee stirrer straw as your ‘bobbin’ and stick the needle down inside it, you avoid the sticky from the tape. 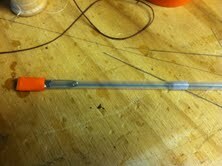 This will then fit inside the larger drinking straw with the safety pin(s). Electrical tape does have a tendency to leave a sticky residue over time and when exposed to heat. Sonia, you are brilliant! Why didn’t I think of that? I’ve gotta go repack those. Thanks! I guess im dense… why and what does the safety pin got to do with anything? Safety pins are mulitfunctional. Besides securing stuff, you could also improvise a fish hook if needed. Ideas for use are up to you. Alternative closure: cut 1/2 inch off straw, fold end of straw down 1/4 inch and slide clipped portion over the fold. Put pin, needle etc in the straw and close the other end the same way. Can open and close as needed. I have my threads already taken care of………..BUT I keep needles and floss in my first aid kit just in case I need to sew wounds. I’ll modify this using a coffee stirrer and insert needles prethreaded, then attach the stirrer to the container of floss. Never know how large a wound might need longer thread. GREAT IDEA and you might consider painter’s tape, it is meant to stick but not leave any sticky on walls so should work here too. The green painter’s tape is stronger than the blue. I’ll keep that in mind for a non-sticky sewing straw. Thanks! Any extra cordage you can pack would benefit you in an emergency. Not sure which type you’d want to pack. I know this stuff is strong. I’ve seen primitive arrows hafted with dental floss. Waxed or unwaxed would work.